In the popular imagination, there has long been a romanticized picture of quilting as “quilting bees” in which ladies gathered, gossiped, and used their genteel skills to create colorful quilts. Folk art aficionados and museums have elevated quilts made for everyday use into works of art and the market for vintage quilts has gone through the roof in recent decades. Quilts are works of art but lost on many are the practical utilitarian reasons for quilts to exist in the first place. As beautiful and artful as quilts may be, they were used to keep us warm and most of the people – mostly women – who created them were creating them as part of their job to feed and clothe and look to the comfort of their families. As beautiful as many quilts are and as much pride as is shown in the careful and intricate construction of quilts, their exhibition and appeal to collectors was far from the motivation for the quilter. More likely the motivation was along the lines of Will it keep the family warm at night? and Will it hold up? and Will I be embarrassed for the neighbor ladies to see it hanging on my clothesline? As a child, I was fascinated with the quilts that would come out of the chiffarobes and cedar chests and closets when the nights started to become cool in the fall. The intricate patterns and pieces of fabric told a tale of the maker and her family. 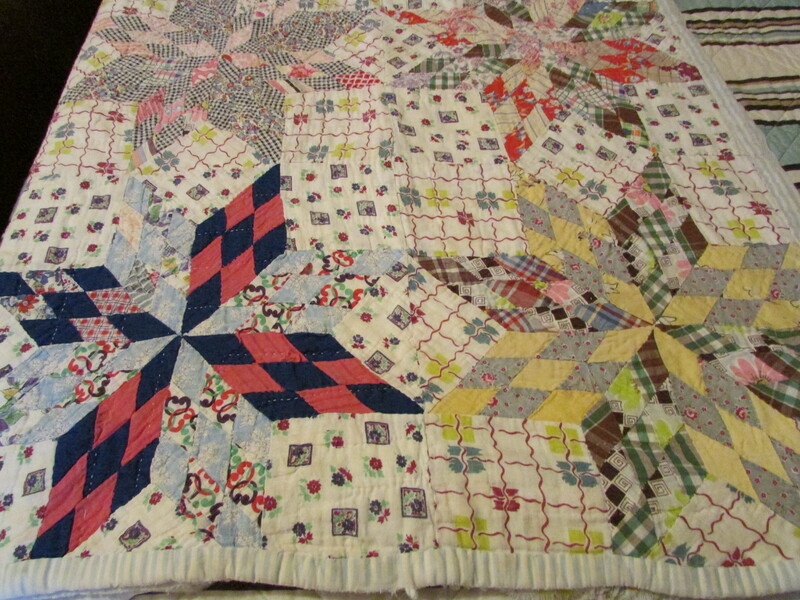 As I became older, my mother would occasionally offer me quilts that she had from her or Dad’s families. I have never turned down the gift of a quilt and now have a small but precious collection. I am always curious about the provenance of the family quilts I receive but, because of the nature of the pieces and their creation, the information is often sketchy. These quilts, after all, were not made to be passed down as heirlooms. They were made to cover people and beds and serve a purpose. I have quilt tops that never got quilted and at least one quilt attributed to Snow Patton Journey, one of my paternal great-grandmothers. I hope Grandmother Harbison is not horrified when I say that this is my favorite quilt and I am proud to show it to others. It is clearly a “crazy quilt,” with unmatched and large pieces of fabric and no patterning. In examining it, my guess is that it was put together very quickly (perhaps in advance of an approaching cold spell?). 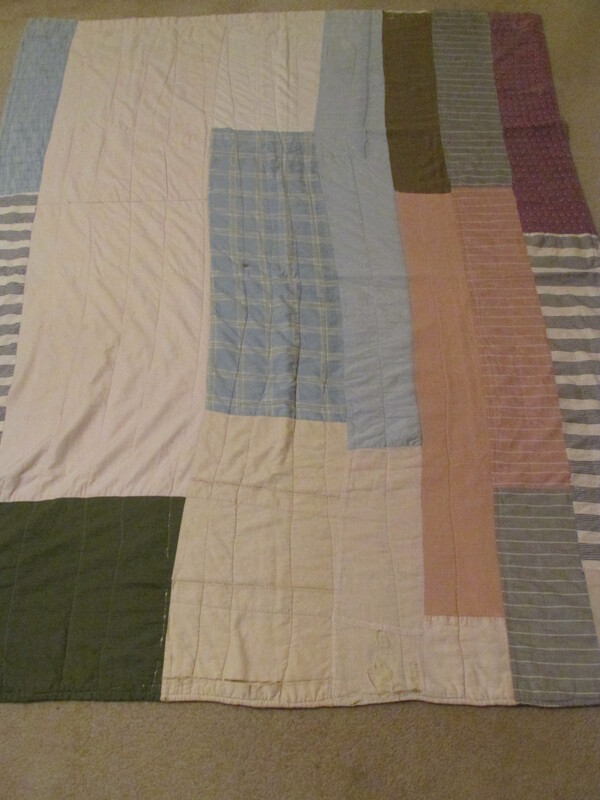 It is also the heaviest and warmest quilt I have ever encountered. I don’t much like cold weather but one of the few pleasures of “the weather of northern aggression” is knowing that I will be sleeping under this amazing quilt for a while. 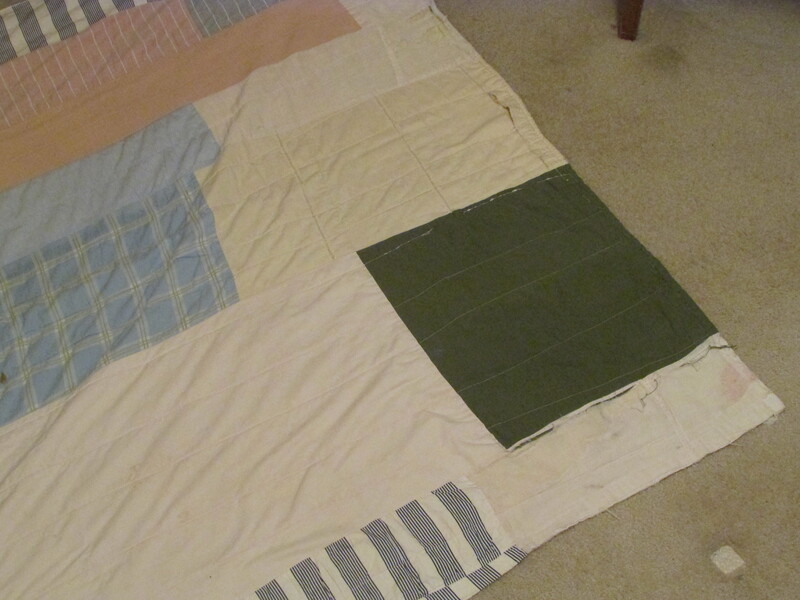 My mother can’t remember when this quilt was made but I am guessing the 1940s before Mother’s family relocated to Birmingham after World War II. Mother says that’s a good guess since she doesn’t recall Grandmother quilting after the move to Birmingham. As an artist and as a lover of art, my tastes often run toward the modernist and minimalist and Grandmother Harbison’s quilt fits in both categories in its abstract and random collection of fabrics and in its asymmetrical and challenging composition. There is a large square of solid olive fabric placed near one of the corners that always reminds me of the blocks of color or text found in some Asian prints. This would not have been something my grandmother necessarily knew about but the artistic impulse and prescience intrigues me. Grandmother always said that every room should have a touch of red somewhere and I always thought Well, she and Diana Vreeland have that in common! One of Grandmother’s “nicer” more traditional quilts lives on the foot of the bed in my guest room but it’s the thick and crazy one that will cover me tonight and for many nights to come. This entry was posted in art, culture, quilting, the south and tagged Alabama, art, culture, Eula McCarn Harbsion, memoir, quilting, the south on November 16, 2014 by gedwardjourney.